Soigné nail varnishes are a little on the pricey side at £11 each, which makes them around the same price as OPI, but when they have a sale their prices are usually slashed to half price, which I think is a bit of a bargain. The sale I got these shades in finished several weeks ago but they do appear to have sales quite regularly. If you're interested in giving them a try or adding to your existing collection I'd recommend following them on Twitter or signing up to their emails so you know when the next sale launches. The eagle eyed amongst you may have noticed that I've swatched the red shades the wrong way round, sorry about that! I have a nice little collection of Soigné shades now; two of their boxed collections and five individual shades has taken my total up to 15. 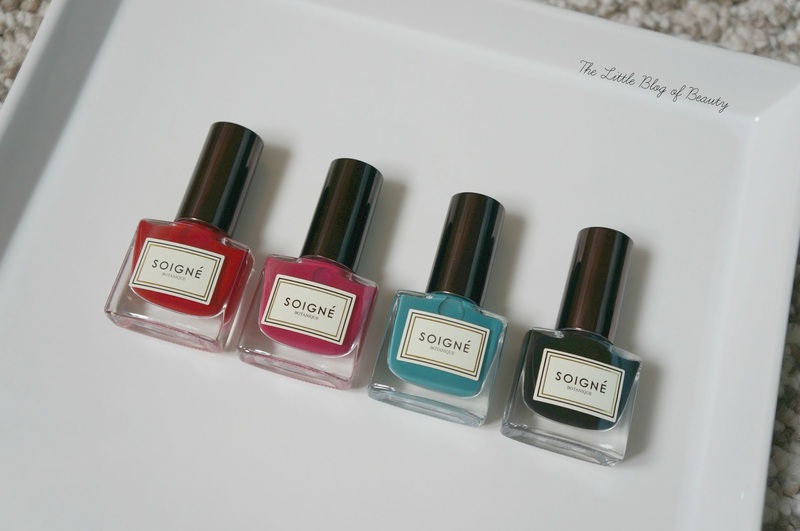 If you're not familiar with Soigné yet they're five free, vegan friendly, against animal testing and made of up to 85% plant-sourced, natural ingredients. I really enjoy using their nail varnishes as they're really easy to apply, although they can take a few coats to build opacity as they are quite thin, and I also find they last really well. I placed this order back in June using some birthday money but I was obviously craving some darker A/W type shades at the time. I'll start off with darkest of them all, L'encre de Seiche, which is a deep inky black. I have a shimmer black (Nails Inc Alexa Silk) but don't have a good flat black shade so thought I'd pick one up for nail art or when I'm feeling super dark nails in the winter. Although I've never really been a fan of blue or green nail shades in the past I've found myself picking up more and more of these sorts of shades recently. I spotted Glaҫage turquoise and it caught my eye, more as a colour in general than a nail shade, so I decided to try it. Although the name suggests this is a turquoise it's actually much closer to a teal shade. My camera has captured it very similar to the shade shown on the Soigné website but I'm afraid neither are quite right. This is a deeper shade that is more on the green side than the blue it appears above. Cerise is not bad as a description of the corresponding shade, I would say it's a deep cerise. On the website this actually looks much more like a purple shade and is described as like a cherry pie. Finally Betteraves rouges is a deep sultry red and the swatch on the website is actually pretty close, although when pictured in the bottle it looks a little darker. 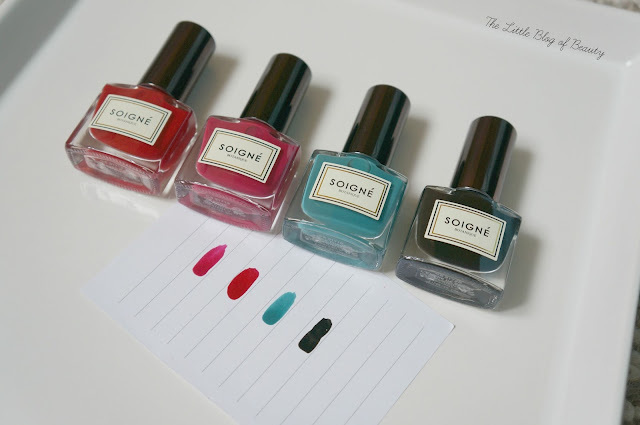 I'm a big fan of Soigné nail varnishes but I am a little disappointed that some of the shade swatches on the website aren't very close to the actual shades. I believe the only way you can currently buy Soigné nail varnishes in the UK is through the website (and a few shades available through the Birchbox website) so this does make it a little difficult choosing the shades you want. I know showing accurate shades online is always difficult because of different screens displaying different colours, so it's not something you can get round easily. I usually search for pictures on Pinterest to try and get a rough idea of a shade but there are very few pictures of Soigné on there. I should have done a Google search as the pictures on there are quite good for showing the true shade. 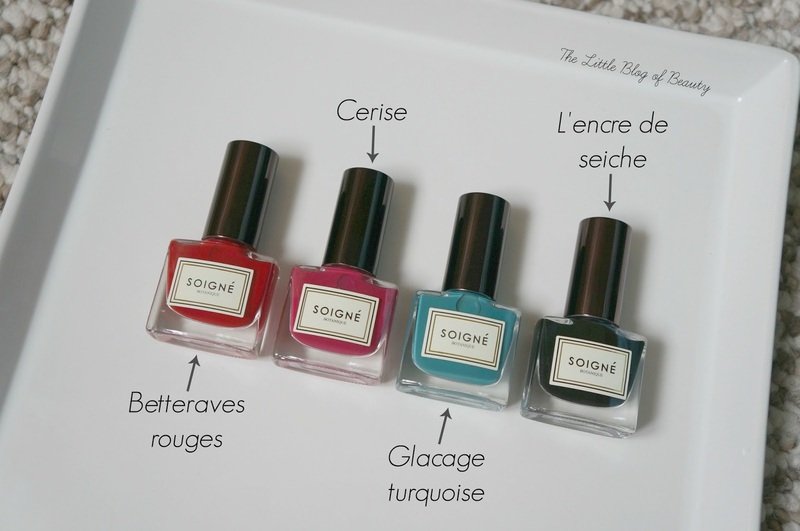 Have you tried any nail varnishes from Soigné?